Melt 50 gram butter with 50 gram sugar and pour this in a greased round cake pan. Arrange the pineapple slices in this mixture. Put the other ingredients together and beat well; pour the batter on top of the pineapple. Bake the cake 45 minutes in the oven at 170 degrees Celsius. Allow it to cool down slightly and turn it upside down. For Upside down pies, look at the recipe for tarte Tatin, pineapple tarte tatin, pear spice cake, rhubarb tarte tatin and for a savoury version endive tarte tatin. On 26 November 1778, Capitain James Cook is the first European to reach Maui, the second largest island of Hawai, nowadays belonging to the USA. Click on culinary calendar for Links between cooking and worldwide history. 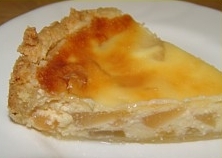 The Worldcook website also has a different recipe for pear ginger pie.